What do tongue ties, lip ties, oral aversions, and picky eaters have in common? Everything! Listen as two experts talk about how pediatric dentistry and speech therapy are both helping parents discover ways to help their children. You can listen to this complete podcast on iTunes or SoundCloud. Alyssa: Welcome to Ask the Doulas. I am Alyssa Veneklase, and I am here with Courtney and Katie today. Courtney is with Building Blocks Therapy Services, and Dr. Katie is with Pediatric Dental Specialists of West Michigan. Welcome, ladies! I wanted to get you two together because I’ve talked specifically with Katie before about pediatric dental topics, and then with Courtney about speech therapy. I’m thinking they both have to do with mouths, so I figured we would have a lot to talk about together. So it sounds to me like in the dental office, Katie, you often are the one who sees these signs of speech delays before parents even understand that their child has a speech delay at one, two, three years old? Alyssa: So they don’t see Courtney or call Courtney because they don’t even know there’s a problem yet. So how does that work? What does that look like? Katie: Well, on a day to day basis, I am seeing so many kids of all ages, and I have these interactions with kids, and I have a sense of the wide range of normal in development. I can anticipate and see when maybe there might be something arising, but also a lot of any speech development issues I see really has a lot to do with their anatomy. So that’s what I’m evaluating as well, whether it’s tonsils or some kids have tongue ties or other ties in their mouths that can cause some issues with speech, and other things I’m evaluating as well that I find that I really need help from a speech pathologist, actually. And that’s where you come in, as well! Courtney: And I also have parents who are constantly asking me, regarding any speech delays, “Could this be a dentition problem? Could this have anything to do with their oral cavity?” So I think that a lot of times that we kind of cross paths in a lot of ways. Alyssa: So what about a kid who – is it called an oral aversion if they don’t really like certain types of foods or maybe textures of foods? Let’s say I’m working with a sleep client, and this kid is two, won’t eat much, doesn’t like certain types of foods. Is that a dental issue? Is it a speech therapy issue? Is it both? Katie: It can often be both issues. I will see a lot of kids come in, and kids are always going to be picky, and that is totally normal. Alyssa: Especially at that age, right, to a degree? Alyssa: Yeah, you don’t realize how much you move your tongue around, right, to move food around? Katie: Absolutely. The tongue is one of the strongest muscles in our body, and if you can’t use it properly, it’s going to be really hard for them to manipulate food around their mouth, chew the food, and thus swallow the food, as well. So I don’t know if you want to touch more on your experience with that, as well, Courtney. Courtney: Yeah, so as we eat, our tongue has to have a significant range of motion to it, so especially if that tongue is tied in, we have to be able to actually initiate the swallow. We have to be able to push our tongue up against the roof of our mouth to create the suction to be able to get all the food to actually go down into our esophagus. But also, along with that, when you’re looking at different textures of food, you have to be able to manipulate it in your mouth. So if it’s going into your cheeks; if it’s getting stuck around your teeth; you have to be able to do tongue sweeps or to be able to angle your tongue to be able to move all the food towards the center of your tongue. So if there’s not that range of motion in there, then it’s going to be really hard for them to use different textures of food. So as a speech therapist, a lot of times when a parent will say, “Oh, they’re really picky,” I’ll look at the pattern of textures and what is required for the mouth, the tongue, the cheeks, and everything to do to manipulate that and see if there’s a pattern with this. Wow, they really don’t like those liquids because maybe they can’t control. Maybe it’s coming out of their lips. Or that bread, when you’re chewing the bread and crackers, that sticks together, a bolus, and it sticks together so they don’t have to manipulate that tongue as much. So we start to look at all that and their structure. Katie: Yeah, exactly. And it’s just something we don’t even think about. It’s a natural reaction because it’s not normal to have pockets of food in your mouth and things like that. That’s something I even see a lot with kids coming in. I’ll see that they have food pocketing where there’s actually food stuck in their cheeks, in the vestibules of their cheeks. Alyssa: That’s what I just imagining and visualizing in my head, that if a kid had a tongue tie and isn’t able to move their tongue over to the side, like if I have something stuck down here, I can pop it out with my tongue. So if they can’t get that out, it’s just going to sit there, which is going to smell and cause tooth decay and make it difficult to – I wouldn’t want to eat very much, either, if I knew it was going to get stuck down there. Katie: No, you’re going to know what works for you and want to just stick to that, yeah. Alyssa: So what other kinds of things do you see that might be speech-related, or is that the biggest one? Katie: That’s the biggest one. A lot of it, too, is how you were talking about their orthodontic occlusion, so how teeth are biting together. One thing that can definitely impact speech is how your jaws are growing, how your front teeth are overlapping or not in the front, as well. A lot of kids who have had a pacifier longer, like past age three, have a finger-sucking or a thumb-sucking habit. Even kids who have used a sippy cup for an extended period of time. All of those things can cause what we call an open bite, meaning your front teeth don’t overlap, and they often have what’s called a large overjet, meaning your front teeth are not overlapping how they should. From the front teeth to the bottom teeth, there’s a very wide gap between them. So that, I know, can cause some speech issues as well because your tongue isn’t really able to be placed where it should be properly on those front teeth, right? Courtney: Yeah, so our speech sounds are all how we manipulate that airflow, and we manipulate that airflow with our tongue and with our cheeks. And so where we place our tongue, a lot of times, we’re doing it just behind those front teeth or against our front teeth, and so that can – and then there’s more behind the scenes; there’s so many muscles in the tongue, but it can really – there’s different areas that then the air can sneak out, so then you don’t have those quality speech sounds. Alyssa: So do you teach children to move their tongue differently? What do you do? Courtney: Well, there’s a kid that I have right now who tends to jut her lower jaw out when she does her SH sound. A lot of kids have trouble moving their jaw separate from their tongue or dissociating all these different parts of the mouth. And so we’re talking centimeters at a time, fine-tuning where that tongue is and where that jaw is. Everybody speaks in their own way and produces their sounds in their own way, but what sounds the most acceptable to those who are listening? So it’s being able to kind of manipulate exactly where that tongue is and all of that. Katie: And that’s something, too, where if you’re noticing you have patients with having those types of difficulties, definitely touching base with them and asking if they’ve been able to see a dentist or an orthodontist and just kind of gauging if they have any history with that, as well, because that’s something that we wouldn’t want to go missed, either, if that’s something that can help them. We would want to do that, for sure. Courtney: Exactly. Some kids have the palette expanders and things like that. Katie: Yeah, even how you were talking about how her lower jaw is moving forward like that. That could be something to do with how her front teeth actually occlude. It could have something to do even with her TMJ or something like that. Even our tonsils, how big our tonsils are, affects our jaw growth, as well. If our tonsils are really large, our jaw growth and the rest of our anatomy finds a way to compensate so they can breathe. So that’s really interesting, as well, and there’s definitely physical signs we look for that can coincide with large tonsils, especially if it’s something that’s kind of gone missed for a longer period of time. A lot of kids who I see for the first time coming in, even that seven to nine range, at that point, you can really see some changes in their jaw development, especially their upper jaw. They’ll develop a really, really high palette because, again, it’s trying to open up their airway so that they can breathe better. A telltale sign, obviously it’s kids with ADHD and all that as well. Any time I hear that in a medical history, I beeline for looking at the tonsils because if kids are not getting the sleep they need, it comes out during the day because when you don’t get enough sleep, you are going to be more hyperactive. That’s how our brains work. So that’s how sometimes it can affect how they act during the day, unfortunately, and oftentimes I do see kids a little bit older and I see that going on, and they have tonsils that are almost touching in the back of their throats, and that’s very abnormal and not healthy for them. Alyssa: Is that a form of sleep apnea? Katie: Yeah, absolutely. And sleep apnea is really interesting because there are so many things, so many symptoms. A kid won’t necessarily have all the symptoms; they may only have one, and it could be their body actually compensating as it grows to make sure that it’s avoiding some of those symptoms, as well. So, obviously, a kid who snores a lot; bedwetting is one. Obviously, the hyperactivity during the day or just generally their sleep cycle is off and they’re waking up at night, things like that. Those are all signs that we’re evaluating, and sometimes I’ll still have them see an ENT, even when the tonsils are not so pronounced, but just in case. Every body is so different, and how your body reacts to whatever is going on is going to be totally unique for your body. So less than 30% occlusion of your tonsils is pretty normal, but anything more than that could be causing an issue. Alyssa: I love that you think about sleep because I’m obsessed with sleep! That’s my jam! Katie: I love that you are! That’s such a huge thing for us, and going to see a pediatric dentist, we are looking at so many different things because all of that goes into how a child develops. We have so much training on just child development in general, physically and emotionally, and all of that. So we are evaluating all of those things to make sure nothing is going missed because things can, unfortunately. So definitely pediatric dentists have more school that we go through to be able to learn those things, thankfully. Not that general dentists don’t, as well, but you do have to seek out extra training as you graduate, and it just kind of depends on what opportunities you find and learn and all of that, as well. Since I’ve graduated from residency, I’ve had to seek out meeting speech therapists and pathologists to learn more, and obviously training on lip and tongue ties and the procedure to help relieve that for kids. 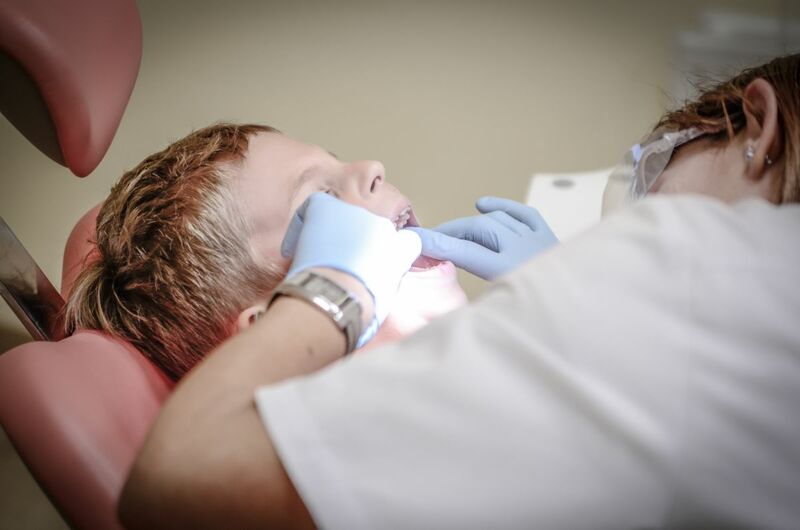 So that’s something that we can work together on, as well, because I can use a laser to actually to a frenectomy, which means we can remove that extra tissue that’s causing the tongue tie, and that can give the child so much more mobility and relief. But even when we do that procedure, kids will still need therapy afterwards. The procedure is part of a spectrum of working together to make sure that child is able to function at their best. Courtney: I think that for children, especially, their bodies adapt amazingly, and they compensate so well. And so many things can go hidden with a child because their bodies just automatically do these amazing things, and I think I do a very similar thing, where I really look at how are they functioning in their whole world, looking at the whole child. Like with ADHD; you’re saying that this child is really acting out at school, for example. Well, let’s look at these patterns of behavior and sleep or if it always seems to be around writing time that they have a little bit of difficulty with the endurance of those things. It’s really looking at the whole picture and not just honing in on one narrow thing like the teeth or just communication. It’s how everything is interacting together in their world, because gosh, kids adapt amazingly. Katie: I say this all the time: kids are so resilient! They’re so fascinating, how they can grow and change to make the best of what they are given. And so many situations where I’m always fascinated that they’ve been able to cope for this long in whatever situation it is, and that they’re doing really well, but I know they can do better. Alyssa: I have a tongue tie question, because in my world as a doula, it often relates to newborns. Do you see a ten-year-old kid – or maybe that’s too old; maybe a five-year-old who still isn’t eating well? Will they still have issues? Can you take care of that? Alyssa: So the speech therapy wasn’t looking at the tongue tie? Courtney is over here dying! Katie: And I was, like, oh, my gosh, you poor girl! And I could just see that it was really starting to emotionally affect her. You could tell! They didn’t end up coming back to the office I was at during that time, but they were really relieved when they heard that there could be some other solution, as well. And I talked to her and said that I really wanted her to get another referral for a speech therapist. I wanted her to talk to them about the fact that the pediatric dentist noticed the tongue tie and that we could do a really simple procedure to give her some more mobility with her tongue, but that she would likely need some therapy afterwards, as well. Mom called me back, and she had made an appointment with one of the Spectrum facilities, and then I moved offices, so I’m not sure what happened with it. I’m sure she got the treatment. Alyssa: So without an actual revision done, you can help – let’s say somebody doesn’t want the frenectomy because it’s too scary or just that, I’m 13 and I don’t want to do it. Can you actually help, or is it limited because there’s only so much you can do? Courtney: It would be limited because she probably has already figured out her range of motion and probably put it to the max. So at that point structurally, there’s not much manipulation. You know, as speech therapists, we can’t change structure. And so we have to use the structure that we have, and I’m going to trust in all my ability that that girl probably already utilized what she had. Katie: That’s why sometimes you do need to have that physical change in order to be able to progress in that therapy, and she clearly had not progressed. And I think that’s why they stopped going to therapy, because at that point, what are you supposed to do? So that was just kind of an unfortunate case where something really could have been done way early on because she had clearly been having speech issues. Honestly, at the time, her speech seemed great, and I was much more concerned about the fact that even she said herself that it was hard for her to eat. Alyssa: Well, I’m thinking about a 13-year-old going to a pizza party, and she’s probably dreading it because it’s really hard to eat and swallow. Courtney: Wow, that’s so great to hear! Katie: So that was really cool. I was, like, oh, my gosh. That’s so awesome, and Mom was so ecstatic that they could finally progress a little bit more in their treatment. Usually, when we’re doing a laser frenectomy, we remove some of that tissue, and the kids do great, honestly. You’re a little bit sore for a couple of days, but generally, they can still function normally. Sometimes they need a little bit of Ibuprofen or Tylenol for some older kids, but generally, it’s an easy recovery, which is awesome. And every kid is different with their recovery. Some kids, it’s harder; some kids just bounce back the same day. But generally, kids do really, really well. Alyssa: When they need therapy afterwards, is that something you give? Courtney: It depends. So speech therapy, we work on that musculature in the mouth, and so if need to work on some range of motion exercises with them, but also with that new freedom that they have with their tongue, suddenly those sounds might be coming out different, and they might not know how to manipulate things right away. So providing a hierarchy and all that and working with them on being able to manipulate the airflow a little differently. Alyssa: Yeah, that’s a weird thought, too, being a nine-year-old who, you’ve been speaking for eight of these nine years, and suddenly, your tongue moves completely differently, and you’re saying sounds differently. How weird that must sound and feel! Katie: Well, it is cool, especially because I’m doing these frenectomies from basically birth until whenever they still need them, but it is really awesome to see when an older kid can actually explain to you how it did affect them in a positive way. So that’s really cool. Obviously for kids who are really, really little, I can still see it in a physical way, how much better they’re doing, whether it’s breastfeeding. Courtney: I was going to say with newborns and the latching, yeah. Katie: Even with doing lip tie releases as well, and just how much easier it is for parents to brush at home. So that’s something with occupational therapy, as well. Having oral aversions; if you have a really tight lip tie, then it’s really hard to brush that area because it actually does hurt because your lip is being pulled so tightly against your teeth that it’s really difficult to brush that area. So that’s always something I’m looking for, as well, when I’m in a patient’s mouth moving their soft tissue around. You can tell when a kid is like, oh, that didn’t feel good! And I can see what the tissue is doing inside the mouth to tell, like, yeah, that’s a little too tight right there! I can tell that uncomfortable! So on top of having a parent trying to brush their teeth, obviously for a two-year-old, it’s already still really difficult to brush their teeth sometimes, but having that on top of it – generally, I say you are not hurting your child by brushing their teeth. So if they’re crying, that’s okay, and we give them ways to work through it. But that is something where, yes, that doesn’t feel good, so that’s hard as a parent, as well. But it’s good that we can observe that and give the child some relief and give Mom and Dad a little bit of relief, as well. Alyssa: Well, I think it’s amazing to have these resources for parents where they know that people like you are working together to where you’re not just looking at a tooth; you’re not just looking at the sounds a kid makes. It’s all connected and they need you both. Katie: We all need to work together, yeah. 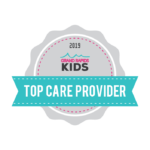 Alyssa: So each of you tell us where our clients can find you and our listeners can find you if they have questions or need a new pediatric dentist or want to have some speech therapy. Katie: Yeah, we are a new office at East Paris and Burton in the Bankston Center, so we will be open on March 11th, but we’re taking new patients right now. You can email us at smile@pdsofwestmi.com. You can also find us on our website. Otherwise, you can give us a call at 616-608-8898, and we’re happy to help you. Courtney: And Building Blocks Therapy Services; I’m off of Alpine, right across from the weather ball; that’s a good landmark. You can find me on my website or give me a call at 616-666-6396. Alyssa: Perfect! Thank you, ladies, for joining us today! Katie: Thanks for having us! So fun!